Review in a Nutshell: Dumplin’ is a good book with an important message, but it lacked in the areas that first grabbed my attention. Dumplin’ follows Dolly-Parton-obsessed-Willowdean Dickson, as she struggles with new insecurities that begin to eat away at her once she finds out the boy who she’s been crushing on likes her back. She decides to do the one thing she never thought she would– enter her town’s beauty pageant. This book takes place in a small Texas town. I loved seeing Will deal with all the types of people in her hometown. I also loved the look into pageantry this book gives the reader, although I wish it was more of the book. Julie Murphy’s writing style is perfect for a lighthearted contemporary. It’s happy and fun, with a perfect balance of humor and heart. There was also a nice message about body positivity (even if the main character seemed judgemental of other character’s bodies) that really made this book stand out. The plot of this book definitely wasn’t what I expected. I went in thinking it was all about body positivity as Will enters the pageant and goes through that process, but the pageant itself is a very small part of this book. It really follows the issues in Will’s life. Her fights with her best friend, her estrangement from her mother, her grief over her recently passed aunt, and her relationship drama. A lot of this book is relationship drama. Luckily for me, I happen to enjoy romance-centered books, but this one does revolve around an unnecessary love triangle that frustrated me for most of the book. It was one of the scenarios where it’s very obvious who the main character will end up with, and the other guy just gets strung along until it’s time for him to go. The characters were probably where this book disappointed me the most. I just didn’t like Willowdean. She’s very judgemental of other girls, focusing on their flaws and calling them out while she makes mistake after mistake with no remorse. There were also a few side characters that I was frustrated with (mostly Callie. She was just a really one-dimensional mean girl). However, I really liked the rest of Will’s group of misfits, which makes me have more hope for Puddin’. 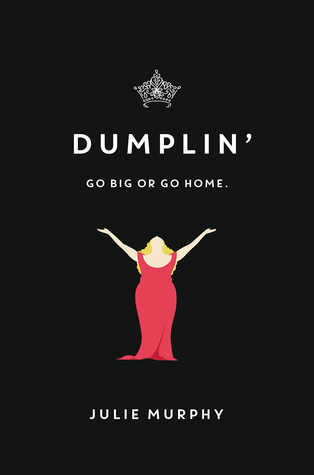 Dumplin’ is a fun book with a nice message, even if it doesn’t live up to all of the hype.